Another week’s worth of mixed good and bad news. Let’s jump right into this week’s roundup. This is getting a little too meta for me. 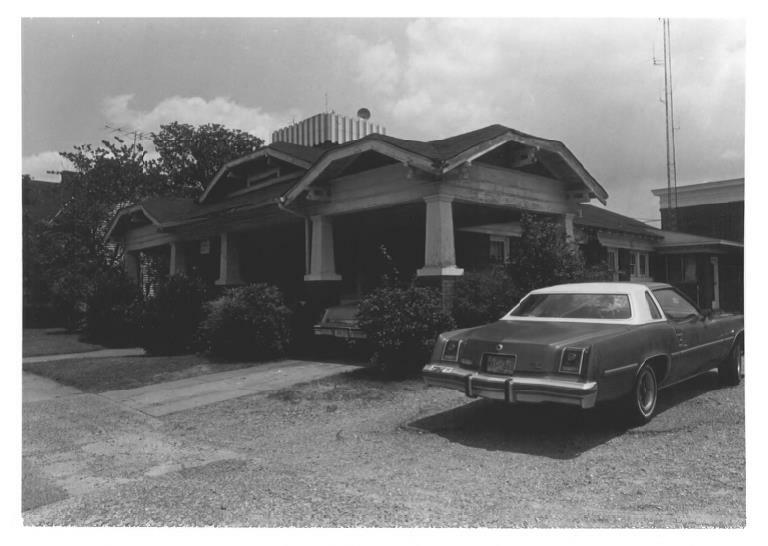 A news story in the Jackson Free Press quoted last week’s news MissPres round-up regarding the demolition of the Fondren House. Now that the historic building is gone, I’ll let you read the stories and draw your own conclusions. My condolences to Fondren residents. I hope you will continue to fight for what makes your neighborhood unique and special. 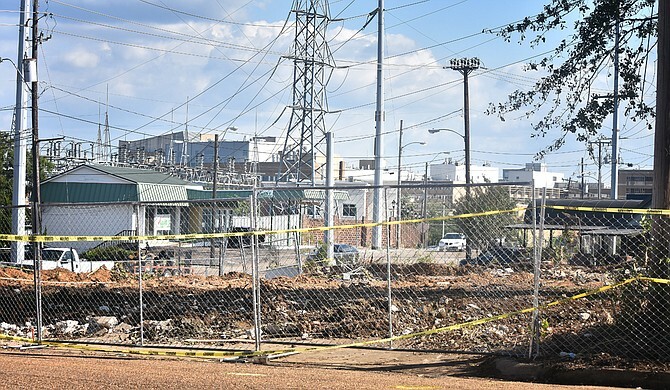 MS Business Journal also had an article adding their 2 cents about the demolition. This past weekend in Vicksburg was the first Preservation Celebration Weekend. Among the events was a tour of the recently restored Fleckstein-Coccaro grocery building located at 1501 Martin Luther King Jr Blvd. Last week from Meridian, we have a story from WTOK stating that final approval from the Mississippi Dept of Archives and History regarding the Threefoot Building renovations was expected by September 29th. No word if approval was received. 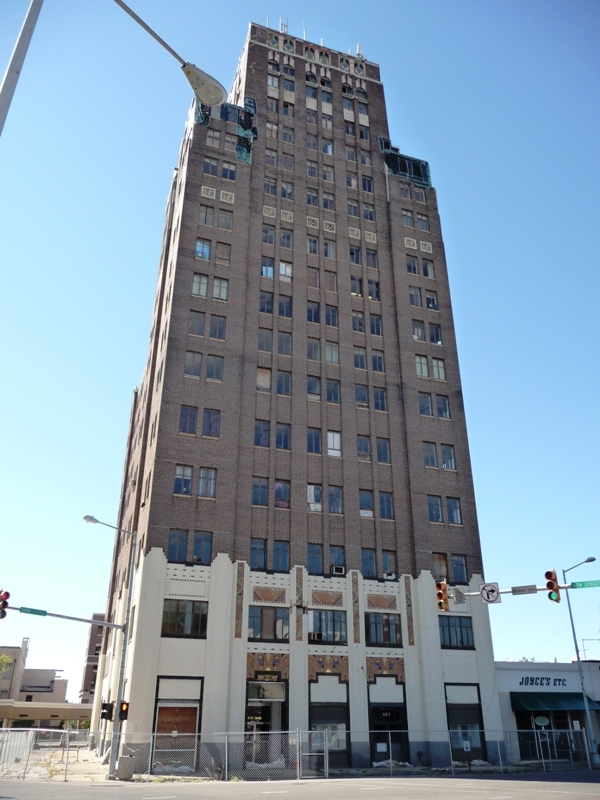 Since the project is receiving considerable funding from State and Federal preservation tax credits, it is important that the work live up to certain standards that will retain the historic fabric and Art Deco appearance of the building. From Philadelphia comes the story that the historic Ellis Theater will be acquired by the Marty Stuart Center. As part of the agreement, the Stewart Center will “invest in improvements to the theater in the near future.” Hopefully these are preservation-related improvements to the 1927 building. The Stuart Center itself will be in the buildings adjacent to the Ellis Theater on the corner of Byrd Avenue and along Main Street, which currently house A1 Maytag, Tri-State Consulting Services, and Advanced Auto. Hopefully these businesses can find other locations within downtown, since a diverse economy is what keeps a downtown thriving. From Columbus, we have a news story that the Lowndes County Courthouse Annex has been demolished. According to the MDAH HRI database the Annex was originally constructed as an office building in 1960. 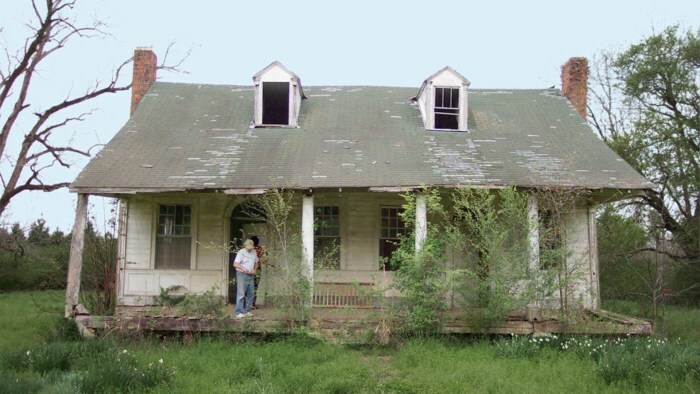 According to the article the county is also eyeing an c.1885 house for demolition. The disturbing thing is that these buildings are being demolished for a parking lot. W. White reported last year in the blog post Four Years, Six Demolitions – Columbus’s Disappearing Historic Buildings Through Google Street View that within this same block, a historic house at 512 3rd Avenue was demolished. This is the continuation of a disturbing trend for a town that is nationally known for its history and preservation. The Delta Democrat Times headline asks “Will Elks Lodge site be city’s new greenspace? That’s the plan . 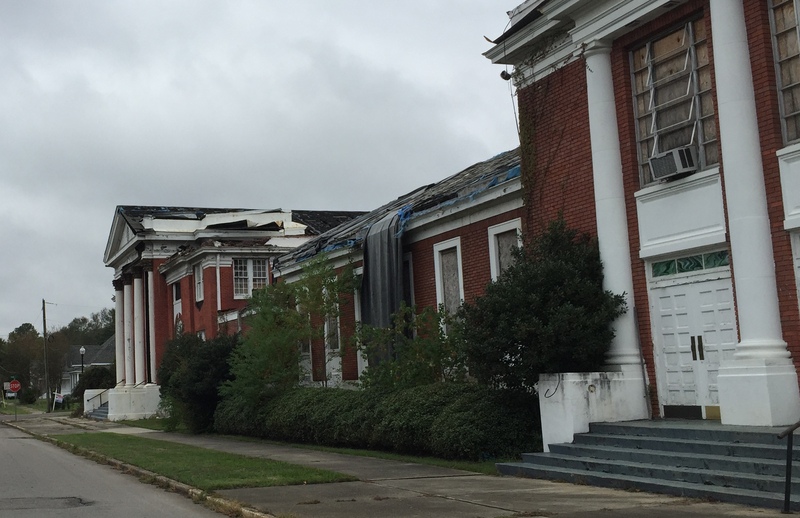 . . ” This is referring to Greenville’s Elks Lodge building, a two-story, concrete-block structure built in 1907 that’s been on the Mississippi Heritage Trust’s 10 Most Endangered list since 2003 and a designated Mississippi Landmark since 2002. More recently it has been endangered by the fact that its site was under consideration for a new federal courthouse in Greenville. 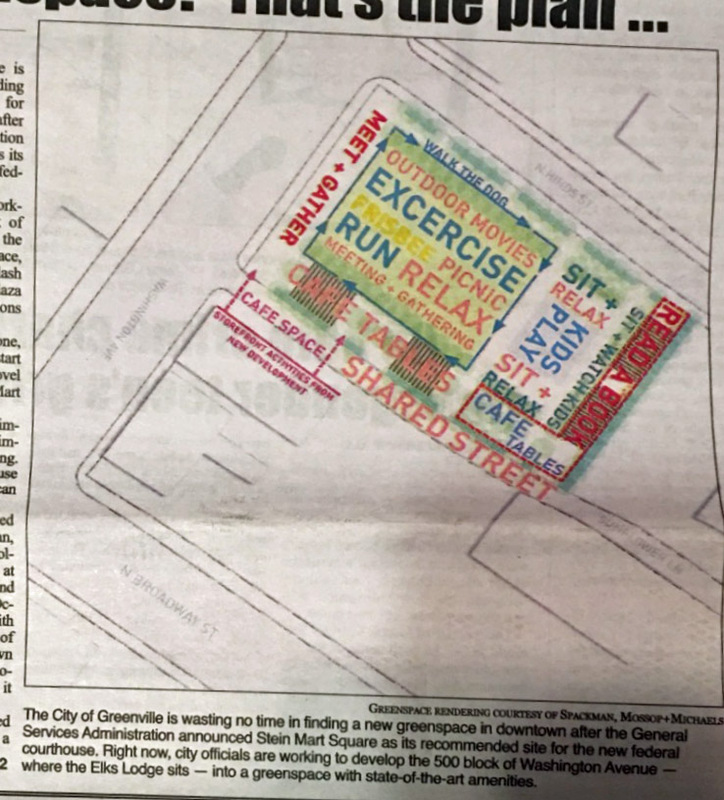 Now that the feds have decided they would rather build on the large greenspace formerly occupied by the original Stein Mart, the City of Greenville is proposing to create a new downtown park . . . you guessed it, on the block occupied by the Elk’s Lodge. 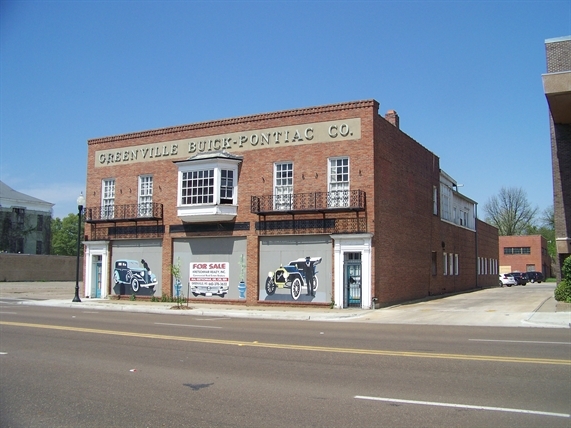 This block also happens to be included in the Greenville Commercial Historic District, and it’s hard to tell from this proposed design by Spackman, Mossop & Michaels of New Orleans whether the nearby former Buick-Pontiac dealership, built around 1926, is also taken up in the new park. Depiction of plan for the block now housing the Elk’s Lodge in Greenville. Conveniently, if you find yourself in the park and are unsure of what to do or where to go, this detailed plan shows that you can follow the large-font text directing you where to sit and watch kids, run, relax, and frisbee, among other activities. 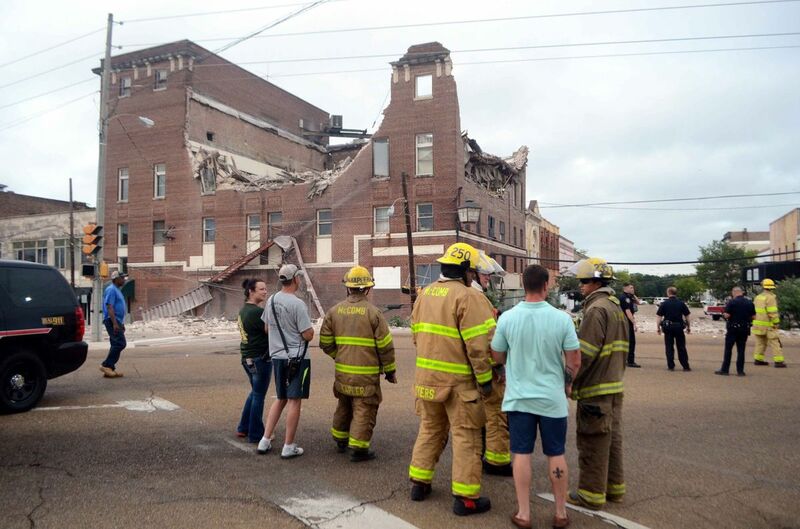 This week’s news regarding the partially collapsed theater in McComb is that the city is seeking reimbursement for the work it did to clean up the building after the July collapse. No word as to whether the building will be completely demolished or if it will be stabilized and restored. McComb City Hall. McComb, Pike County Miss. Other news from McComb is the city’s Board of Selectmen have voted to remove the Confederate Memorial that was erected in front of McComb city hall in 1916. According to the MDAH HRI database the “Granite marker [was] dedicated to the Confederate soldiers of Pike County. The United Daughters of the Confederacy Chapter No. 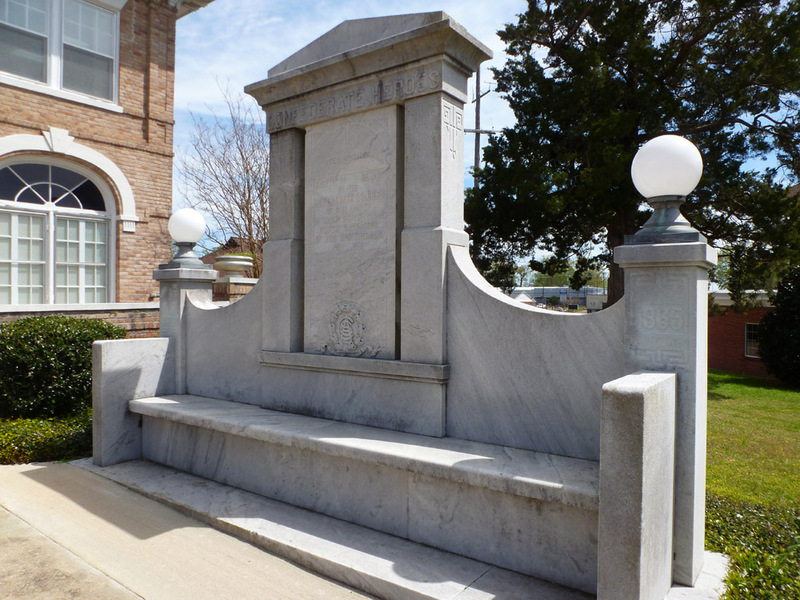 1442 placed the monument at the west entrance to the City Hall… A stone tablet set within an abstracted aedicule surround, flanked by globe lights, above a bench.” The monument/bench is a contributing resource to the McComb Downtown National Register District and is part of a designated Mississippi Landmark (the City Hall property). Bill Borah, who aided in steered an interstate away from the New Orleans riverfront, passed away at the age of 79. If you ever have enjoyed a visit to the French Quarter in New Orleans, Mr. Borah was one of the people you can thank. While the insertion of the elevated highway did considerable damage to other historic neighborhoods in the city, it is hard to imagine nowdays that cutting the Quarter off from the river was ever considered. The John Portman designed Peachtree Center in Atlanta, Georgia was added to Georgia Register of Historic Places and has been nominated to National Register of Historic Places. Portman’s Peachtree Center was revolutionary, ushering in a new era of hotel complex design. While representative of the new wave of buildings becoming historic, I’m sure these nominations will help finance the long-term care of the late 1960s/early 1970s complex through preservation tax credits . That Lowndes County Commission is something. Those commissioners really like their parking lots. Especially considering that the last time I was in the neighborhood of the courthouse on a weekday, there were empty spaces in their current parking lots and on the street. You can imagine how deserted it is on the weekend. I have not researched their biographies, but based upon the actions of these fine, upstanding vulgarians, I would guess that they all own either asphalt paving or building demolition businesses. It’s not empty space; it’s got colorful words and arrows! I stand corrected and humbled by having made such an egregious oversight. Perhaps before the city leaders of McComb agree to remove the monument they should check into the cost. The enlightened City of San Antonio (Texas) City Council quickly bowed to pressure to remove a Confederate statue not realizing that the total bill would be almost $300,000. Statue removal, police presence while it was done, and re-landscaping the gaping hole! Besides the fact that it’s not really a statue, it’s more of a bench. I’m struggling with how that’s so offensive it must be removed. As Bilbo goes, so goes Italo Balbo in Chicago. I suspect that the Bilbo and Balbo bronze statues are the works of Fritz Behn. Perhaps the City of Greenville should look to Natchez as an example of an historic building being saved by converting it to a US Courthouse, instead of building anything anywhere. 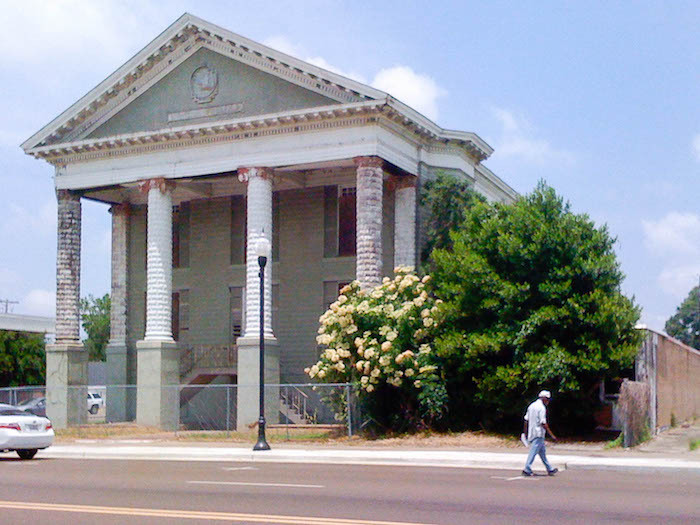 The GSA was persuaded to save the old Institute, later the Natchez Opera House, c. 1852, I think, and did a lovely job. I’m sure you covered this thoroughly before I moved back to Miss. and joined your blog. The old Elks Club building even looks like a majestic public building, such as a courthouse. Has anyone done a cost analysis to compare the cost of building to the cost of re-having the Elks Club? That is an interesting suggestion. That project happened a few years before MissPres started, but how convenient we had a post about institute Hall just last friday. In Greenville, unlike Natchez, the feds already have a purpose-built courthouse downtown, a pretty nice Modernist/International-style building built in 1959. Apparently it doesn’t meet their needs now, although I’ve not personally seen the evidence of why a brand new building is needed. Folks in East Biloxi would like to share the news of their recently completed CLG grant project that included a survey of Civil Rights and African American resources and nomination of the medical office of civil rights leader, Dr. Gilbert R. Mason, Sr. to the National Register. The property received official listing on 9/28/2017: https://www.nps.gov/nr/listings/20170929.htm. As the humble project consultant, I can provide more info. and contacts for the important people in the community.